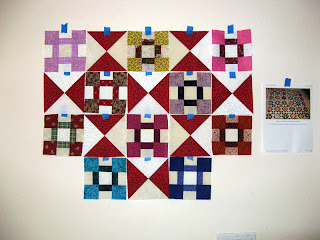 I debated using the cheddar for the hour glass blocks and decided against it. I really like the red print. I think what I like most about it is the size of the print. The pattern is closer together; not certain why it appeals to me more...maybe it is because it reads more like a solid that calms down all the churndash blocks. Well one way or another I'm committed now. The neutrals are all scrappy, only the red is constant throughout. 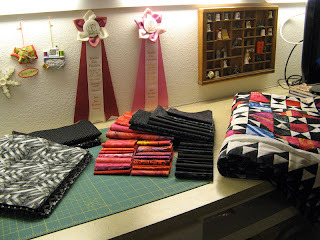 Once I've got it all together I'll be scouring my stash for a suitable border fabric. Maybe the cheddar will come back into play? This is a project done with several others swapping the churndash blocks. 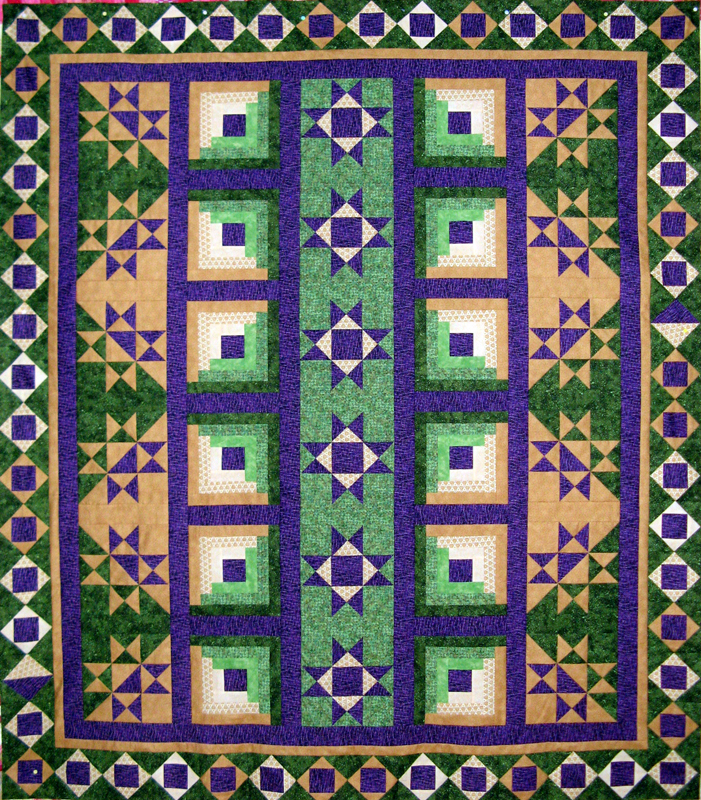 The pattern is one of Bonnie Hunters and can be found FREE on her website. These blocks are from two other projects I'm doing. 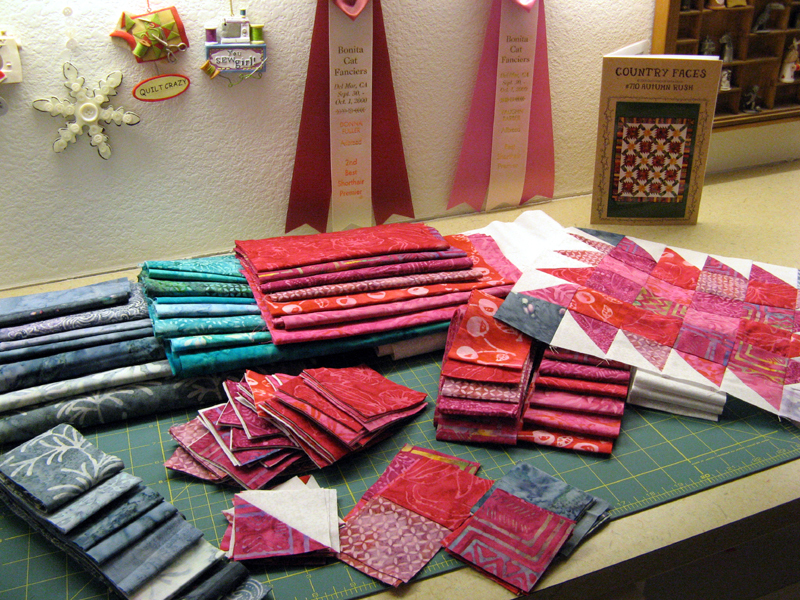 The two on the top are a Quilt Square Quilt Along with Jo's Country Junction. The third block needs to be finished in March. I'll be working on it this week. The pink block is the only one so far in this project from a workshop I took a couple of weeks ago. 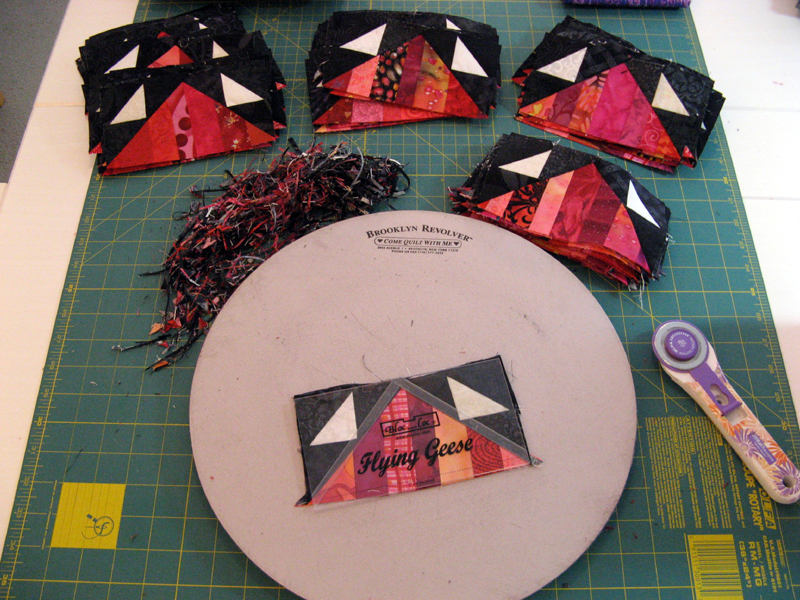 The pattern is called Autumn Rush by Myra Mahy. I've got most of it cut out already. 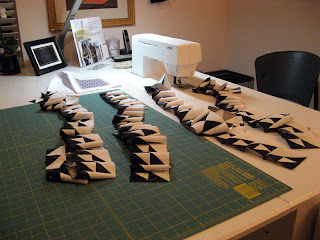 Lot's of HSTs to be made. I'm also proofing out instructions for a workshop that I'll be teaching in September. Probably like you the list goes on and on... What's on your Design Wall today? Check out more through the links on Patchwork Times. I had a great last week completing two projects. Kollinwood Konnections and Kordova Klosure. 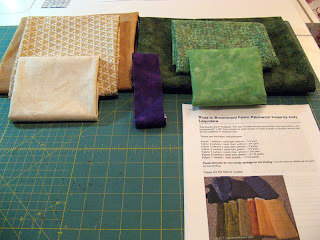 I used every bit of fabric I purchased for Kollinwood Konnections plus some from my stash for the back. Kordova Klosure was made into a king by adding four more stripy borders starting with black and three rows of red. I also assembled 132 10 1/2" blocks of various black and white prints for the back. Lots of yardage USED! It was discovered last week that my report for this year has been wrong for a little while. I've got it corrected now...you know how this HIGH math can confuse us :)! 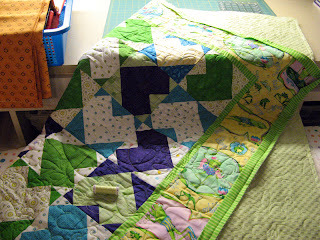 My 2012 March UFO with Patchwork Times is done. 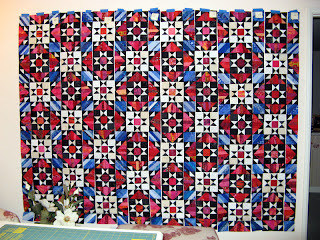 Kollinwood Konnections (Judy Laquidara's Road to Brownwood) finished on Wednesday night. I'm very excited about the way it turned out. I'll be rummaging through my larger pieces to see if anything will work. Wonder what thread color and stitch pattern will catch my fancy when I have it quilted. Any suggestions? Tomorrow between 10am and noon I'll be learning a bit more about the stitches and settings of my new Phaff Expression 4.0 sewing machine. 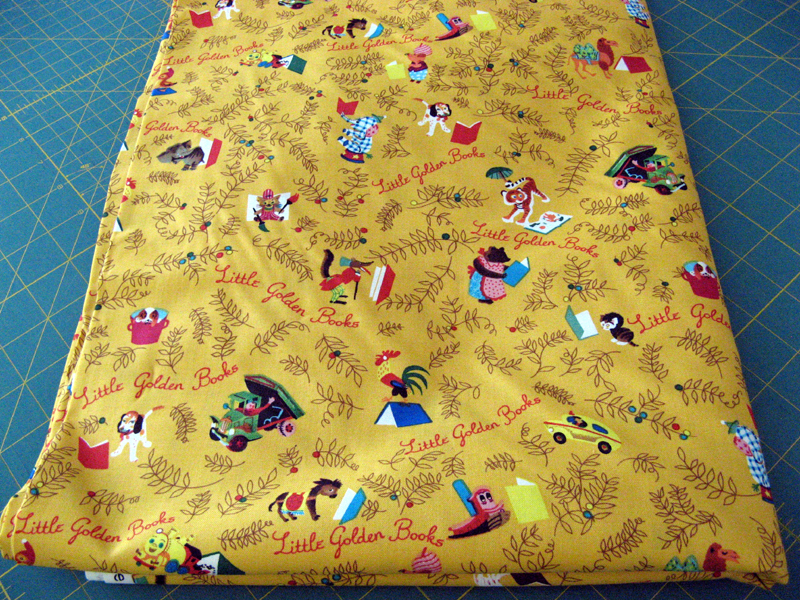 There is a workshop at Paradise Sewing that I'll be splitting my work day in half with this one. Sure would be nice to take the afternoon off since it is a Friday, but I'm a little lean in vacation time. Mom's coming to visit for a couple of weeks in June so I'm saving up! Next project to finish is Kordova Klosure (Bonnie Hunter's Orca Bay). Here it is HUMP Day! Hooray we've made it through most of the week...it's down hill from here :)! 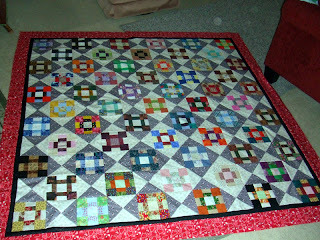 My post today has photos of Debra's Chunky Churndashes quilt project. I coordinated a swap with several others late last year. 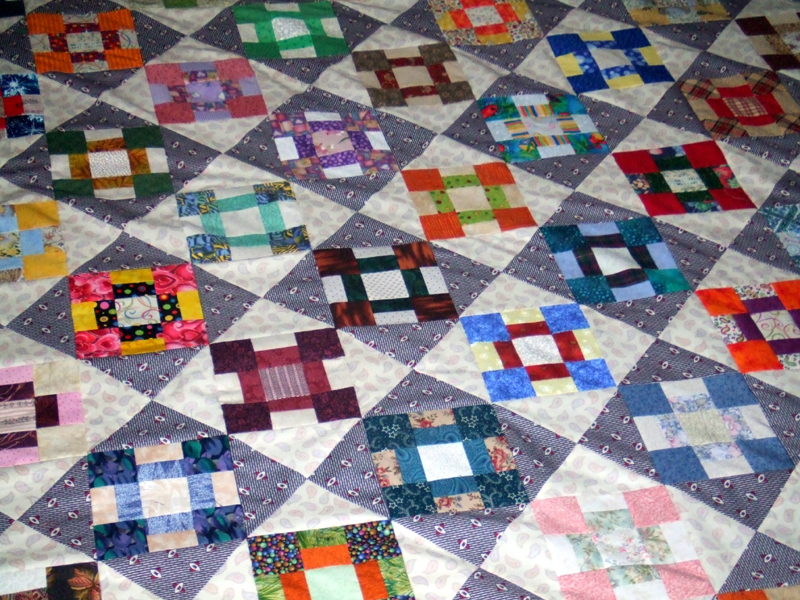 The swap was the churn dash block from Bonnie Hunter's design. (You can find it FREE on her website.) Debra is the first to complete her project. 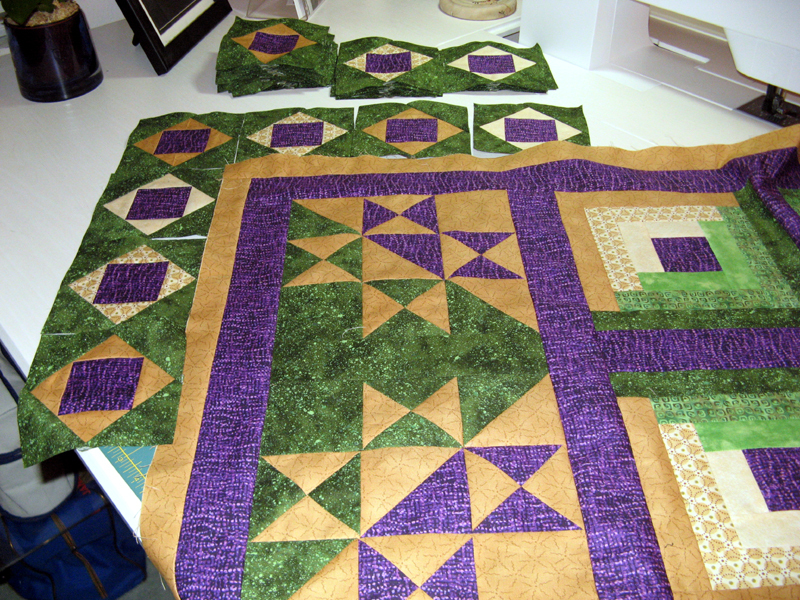 Debra used a purple with a small paisley design for her hour glass blocks along with a neutral. I think the design is neat that it looks like you've accomplished an "on point" design that is assembled in rows. How clever is Bonnie! Great job Debra! There are several others putting their projects together; including me. Hopefully soon I'll have more to show. Until next time happy sewing. Here's where I started this morning with Kollinwood Konnections. Well actually I started with a bit more of than this...I had nearly all the border blocks done. I put the top together just before dinner and the gold border just after cleaning up the dishes. 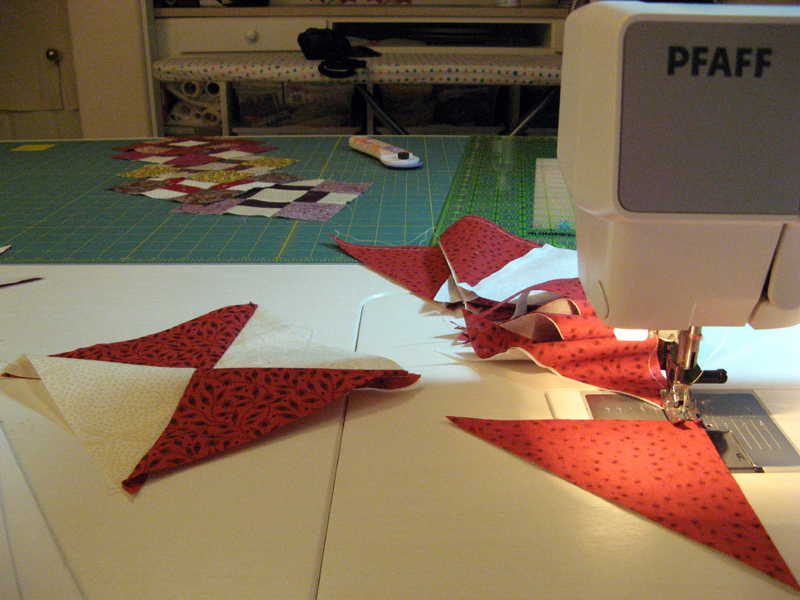 Next I've got the pieced border to assemble. The quilt will finish with the pieced border and be bound with the gold fabric. 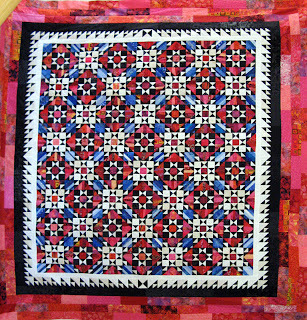 Another one soon to get in the quilting queue at Kerry's Quilting! 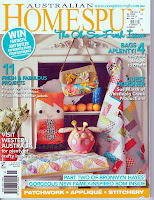 This one is my March UFO with Patchwork Times. It's Judy's pattern called Road to Brownwood. Next up finishing Kordova Klosure. 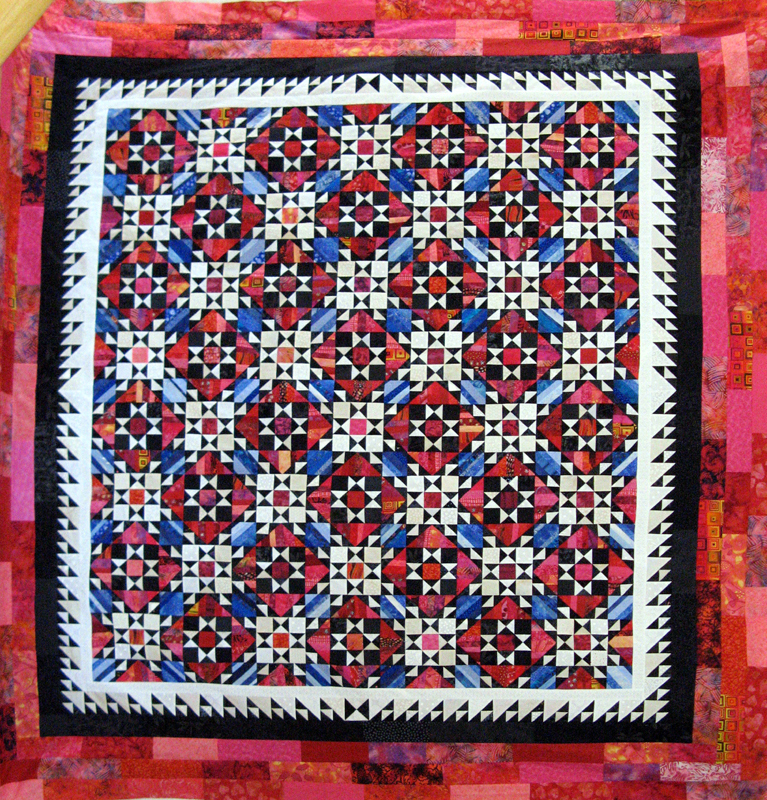 I'm finished with the quilt as Bonnie Hunter designed it. Her latest mystery project that started in November 2011, Orca Bay. 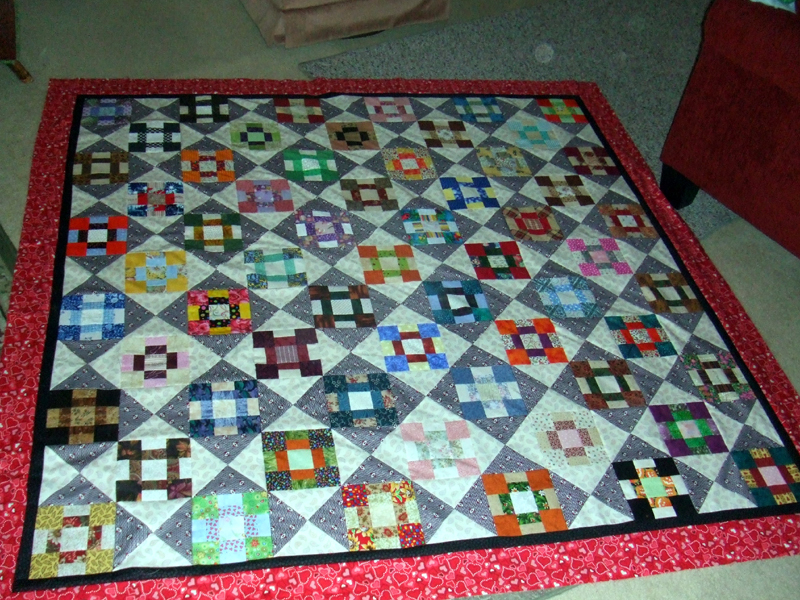 I'm planning to make it a bit larger with a border of black and three additional borders of red. 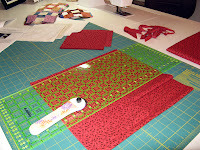 All fabrics will be scrappy to continue with the same design. I found the fabric boxes I wanted to go along with my new cabinet. They are from Target. I found them Friday; ending up going to four different locations to get all eight. I thought I'd only want six but there is enough room in the center for two on each shelf. I had to take advantage of the extra storage. 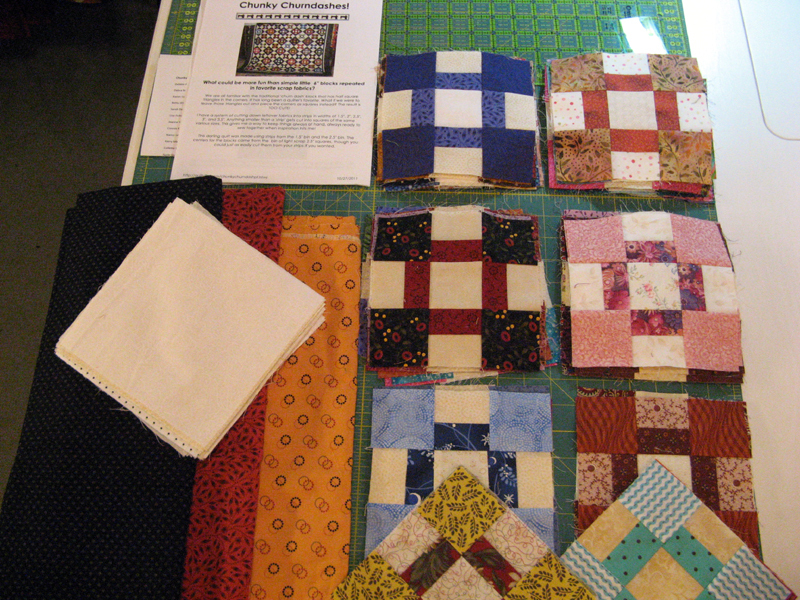 Right now I've got one box full of quilt projects in work; its the one jumping out of the box on the top right. Another is full of Korabell and her three kitties; also jumping out of the box on the bottom right. 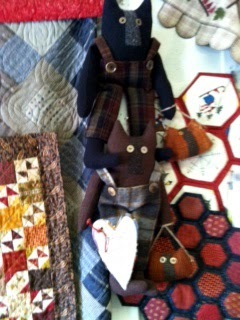 The others are holding various other items from buttons to zippers to patterns and rick rack. I also found some drawer organizers that fit perfectly. I'll show these another day. Hope you have a great sewing week. 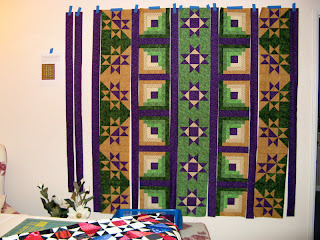 Lot's of other great projects can be seen via the links on Judy's website at Patchwork Times. Good day for sewing in a rain soaked San Diego, California! We got the rain on St. Patrick's Day and into the wee hours of today. Hail hit sometime very early in the morning. I didn't move around far enough to see the time, but it could certainly be heard hitting the windows. I heard there was a very good chance of snow not too far east of us. It always seems weird that not more than an hours drive away weather can be so different. 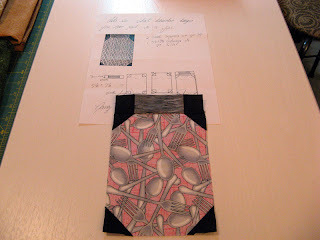 I stayed dry at Rosie's Calico Cupboard in a workshop directed by Myra Mahy. We had lots of fun cutting, pressing in the so important right direction and then spinning our seams to make her Autumn Rush pattern. Amazingly with all the prep work I didn't get to finish more than one Block 1. You see this project takes a variety of fabrics to make it work; therefore lots of prep work. The pattern has you making for Block 1, 16 HSTs and then another 20 squares...that for those of us scrapaholics must be all different you know! I started off the workshop with the gray for the lattice, the teal for Block 2 and the pinks all purchased...yes you know what that means to this report need I say more? 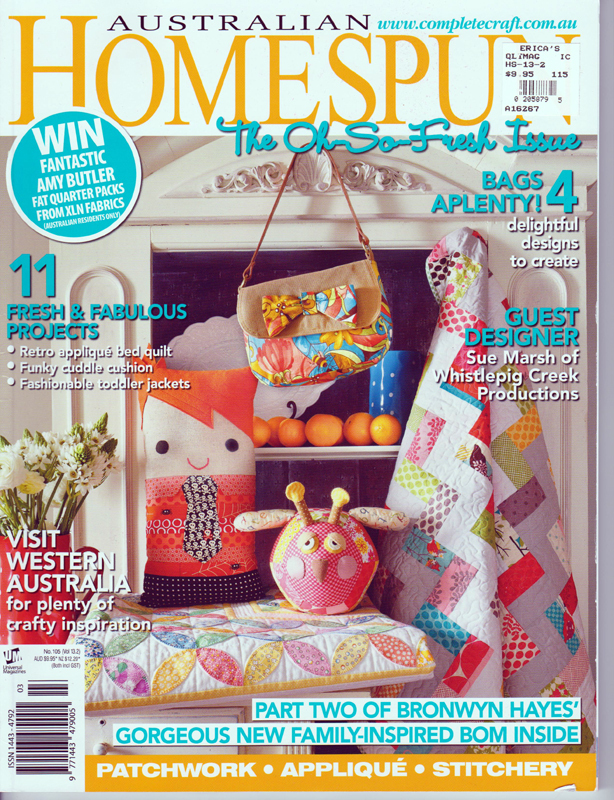 Speaking of pink...thought I'd share with you Australian Homespun issue 13-2 with my quilt Kolonial appearing in the first few pages of the magazine. Don't know if you'll be able to read the words well enough or not. It's Bonnie Hunter's Jamestown Landing design where instructions were provided in an earlier issue of the magazine. Can you see all the neat things I won? I'm still working on a magnitude of other projects. Can't seem to finish any single one of them to make my USED entry bigger. It will happen though and I promise when it does that NET is going to look real good. 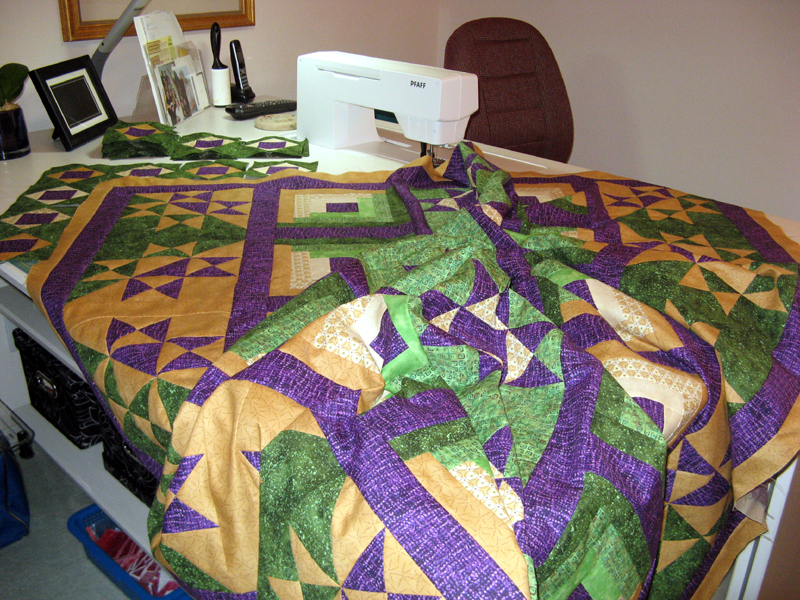 Today I'll be working on the binding of a quilt I just got back from Kerry's Quilting. Kindhearted Klues turned out very cute with a frogs in a green thread. 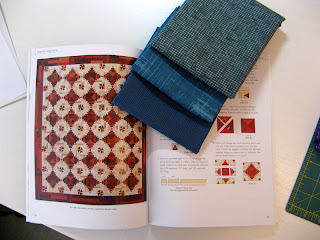 This is the first quilt I've backed with minke. It sure is soft. Morgan my youngest niece should love it. Here's Kordova Klosure. I'm making it bigger with the additional pieces you see. I'm adding 12 finished inches all around. I may have to find some additional reds; I should be set with the blacks. Maybe I'll bind it in blue? 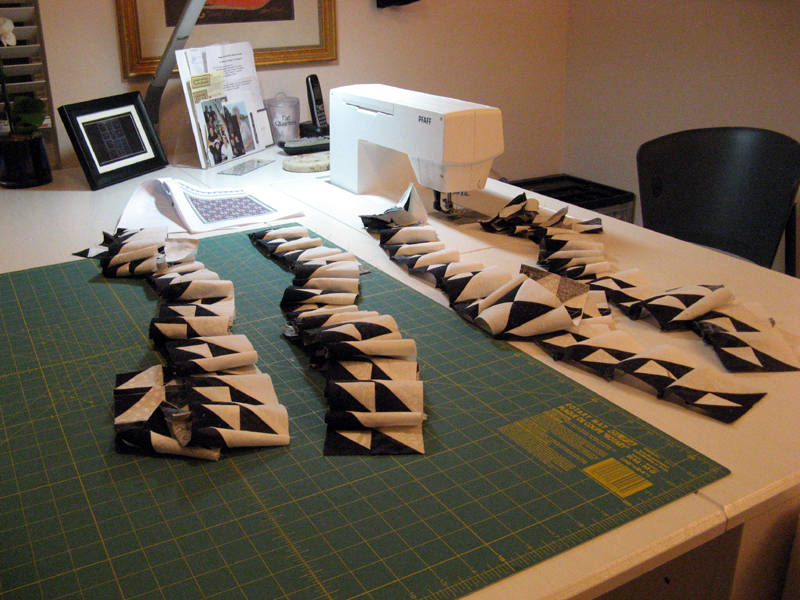 I've cut 10 1/2" squares of black and white fabrics for the back. I've got somewhere close to what I need ready, but need to wait and measure just how many I'll actually need. I'll be continuing through the week on Konnections to Kollinwood and Klunky Korners. Hope you are able to get into your sewing room as much as you want to this week. I've got a 4 day work week YIPPEE! Enjoy the extra day light. 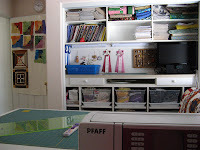 Lots of sewing going on in my sewing room. I have several projects oh so close to completion and the elusive ability to report something used. I've been working steadily on my 2012 March UFO, Konnections to Kollinwood. This one is assembled in columns which is a bit different. 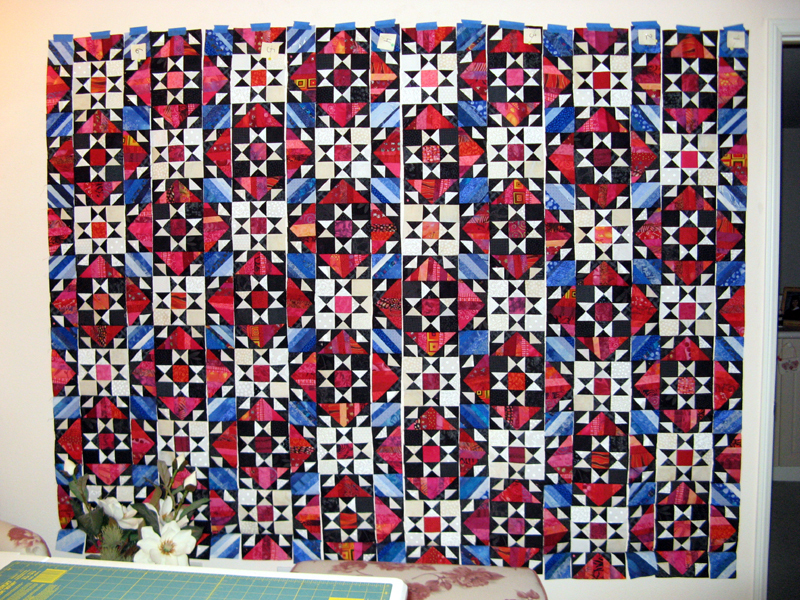 I have the pieced border to get started on yet. 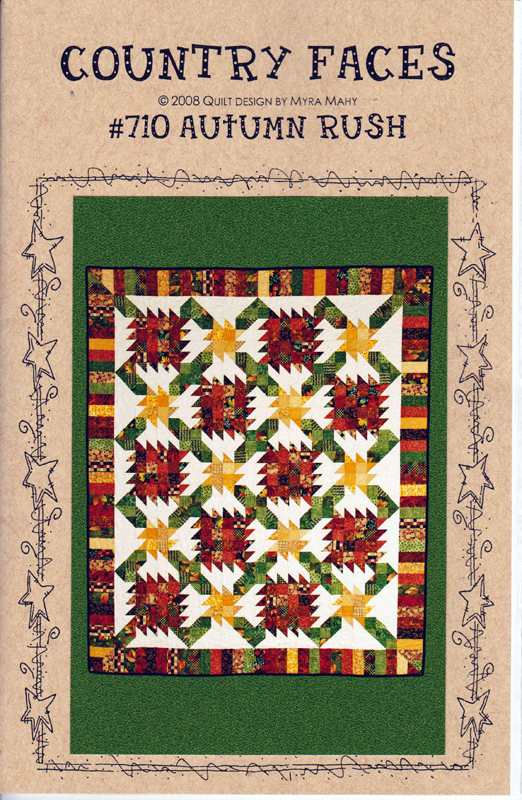 This is a free pattern by Judy Laquidara called Road to Brownwood that can be found on her website. 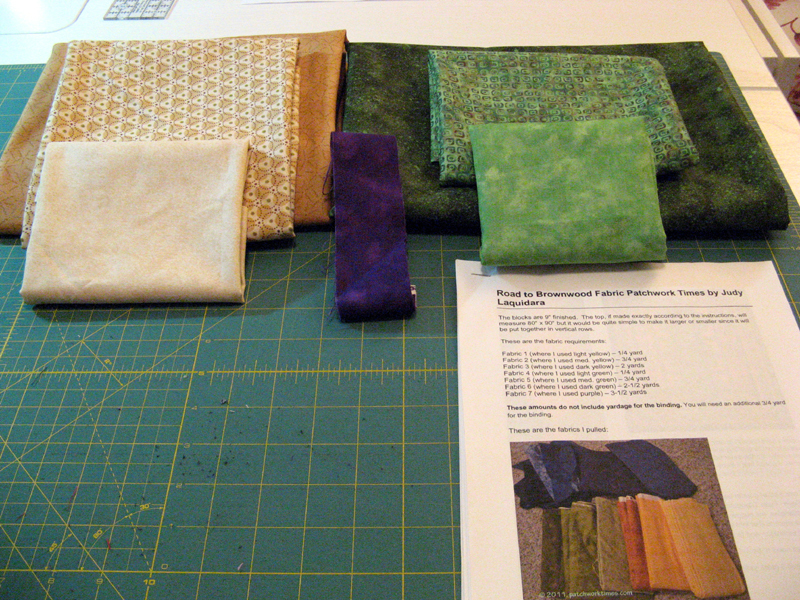 I'm ready to make a decision on one of the three fabrics you see on the left. 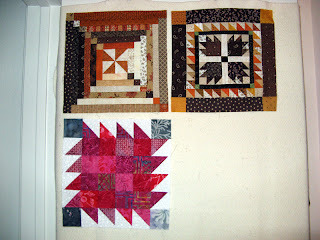 These are my blocks from the Chunky Churndashes block swap just finished. One of the three fabrics along with the white squares make an hour glass block. 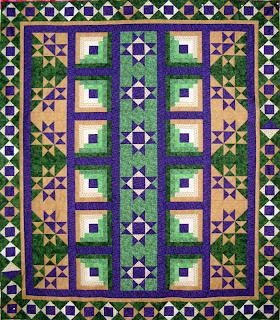 This is a free pattern by Bonnie Hunter that can be found on her website. I'll be calling my quilt Klunky Korners thanks to a great suggestion! 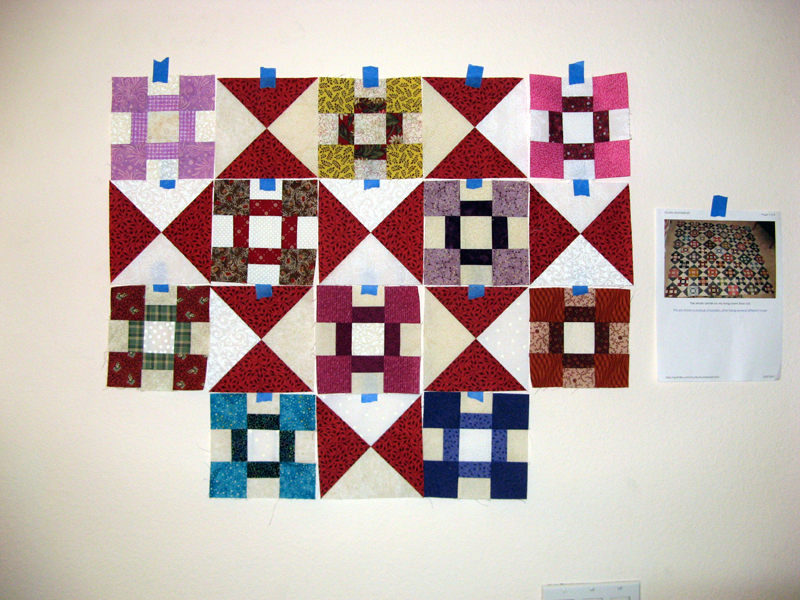 I have started the next block swap with an end of June completion. There are 18 of us swapping 9-Patch blocks for the Bonnie Hunter pattern Crabapple. You will be hearing more on this in coming days. I'm also close to having Kordova Klosure done. It's actually done up to the pattern as was released, but I'm making it a bit bigger. I'll have pictures tomorrow. So you can see I'm creeping ever closer to reporting a usage. I was good not to make any purchases this week too. The net result is two big zeros. Here we go March! Already two months of 2012 behind us...where does all the time go? Today I've spent the good portion of it with Kordova Klosure. I got all the blocks together now into rows. The rows still need to be stitched yet. I also have the border pieces together. Tonight after work I'll spend time stitching the rows and then adding the borders. I'm planing on making mind a bit larger so that it will fit on my bed. I'll be adding a black border and then a red border using pieces that are left. Looking forward to having this project finished so that I can move on to my two March projects. I haven't finished Korabell and her kitties yet, but when I was at Country Loft over the weekend I signed up for another doll class. Fat Cats is really cute and looks quick. Aren't their bags too cute? Debra had signed up for this project and suggested I join in on the fun. I resisted until I saw these at the shop. I picked up a light gray for one of the cats and will look for more of this dark gray stripe or something similar for the second cat. 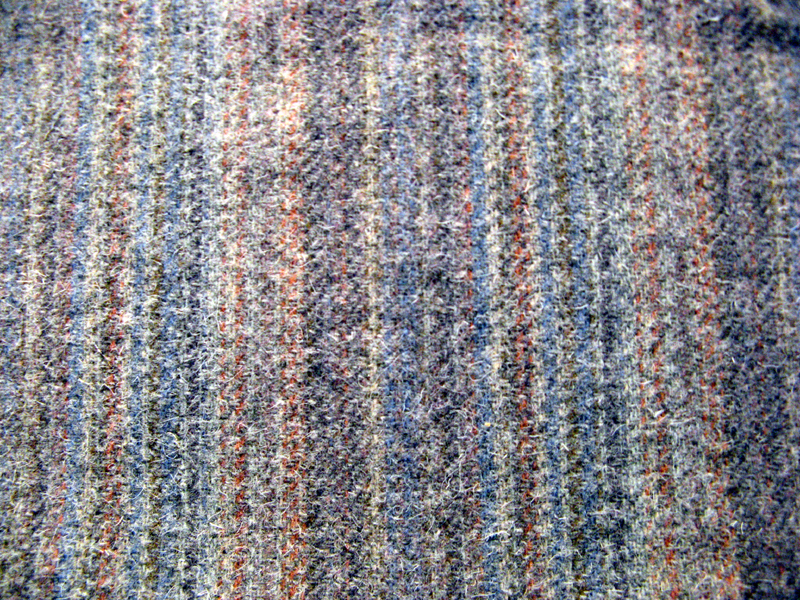 I have a shout out to Heavens to Betsy which is a wool manufacture where this piece came from. Hopefully they'll have another piece; keeping my fingers crossed. Hope you have a wonderful week. Check out more quilty works in progress at Patchwork Times. 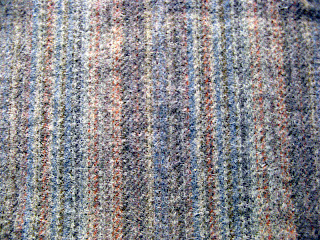 I've had a fun time purchasing fabric this week...not good for the report today, but most all of it will come off in March. You see most of it was for fabric to make my #8 2012 March UFO with Patchwork Times. 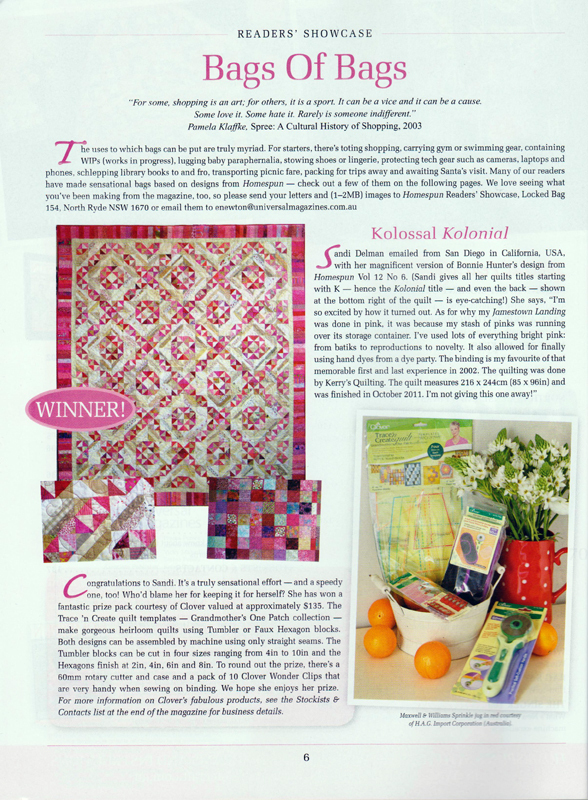 I'll be making Road to Brownwood one of the designs you can get on Patchwork Times FREE patterns tab. My project is to be called Konnections to Kollinwood simply because of the relationship to where my parents live and the easy of changing two "Cs" to that sought after "K". I picked up these fabrics from three different quilt shops. 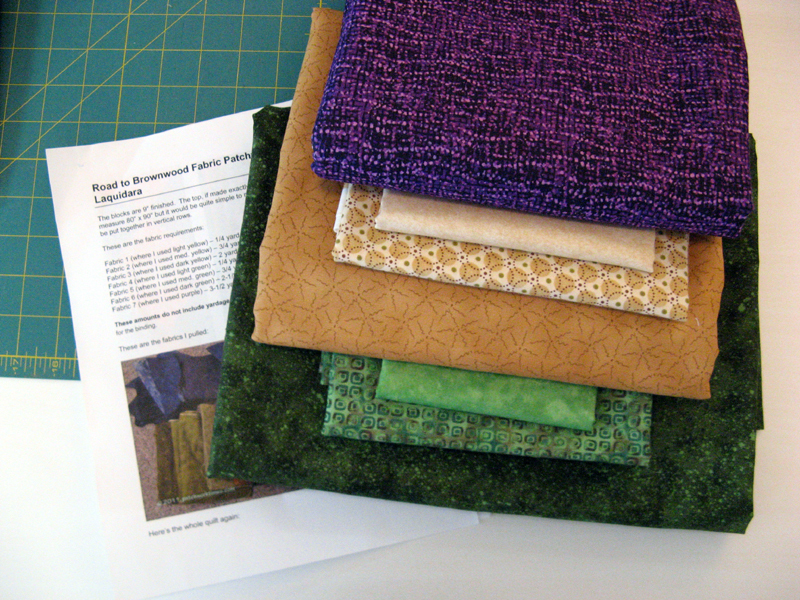 The three greens are from Beverly's, the three camel fabrics from Amidon's and the purple from Rosie's. 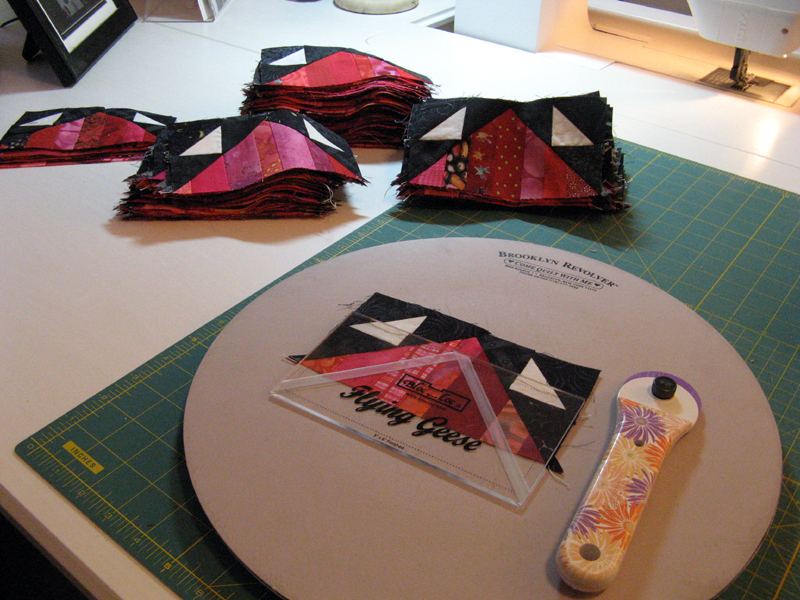 I'll be stopping just after the pieced border and use the dark camel for the binding. 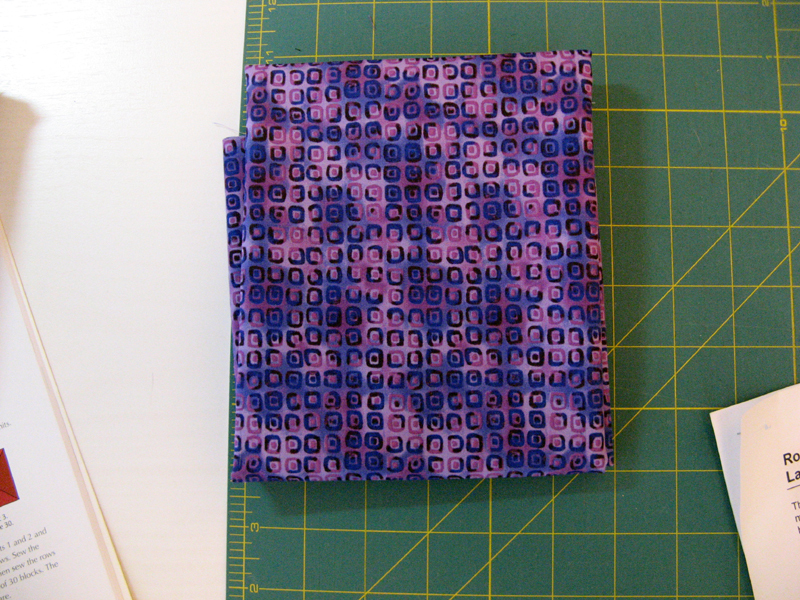 I picked up this purple FQ just because I liked it. I believe it will have a home in another 2012 UFO whose number has yet to be called. Krazy Kins will use bright oranges and bright purples. I'm still working on trimming up the flying geese of Bonnie Hunter's Orca Bay. Kordova Klosure just might get done soon...sure hoping so. The stack closest to the Brooklyn Revolver on the right is yet to be trimmed up. Then as I've been saying, it will be time for block assembly. All other components are complete. So with all this said my numbers for this first week of March. Be sure to see how other quilters are doing using up their stash at Patchwork Times. I'll be heading to Rosie's Calico Cupboard this morning. 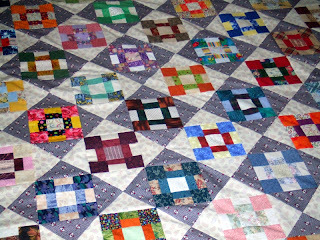 I wWill be meeting up with Debra and Collette to pass off several Chunky Churndashes Swap Blocks. Another reason for meeting up with Debra is to pass along two quilts that will be shown and offered for sale at the 27th Annual Quilt Show & Boutique next weekend Sponsored by the Woman's Club of Lakeside. It will be held at the Vetrans' Memorial Building on Lindo Lane March 9 and 10 both days from 10 AM to 4 PM. If you have a chance to stop by Korrecting Koncealled and Koasting will be in the show. As you can see I purchased the Flying Geese Bloc Loc ruler. Just got it yesterday at Amidons along with a second size. I pressed the seams out as instructed; started trimming them up on my Brooklyn Revolver to help turn the goose to the correct direction for cutting. 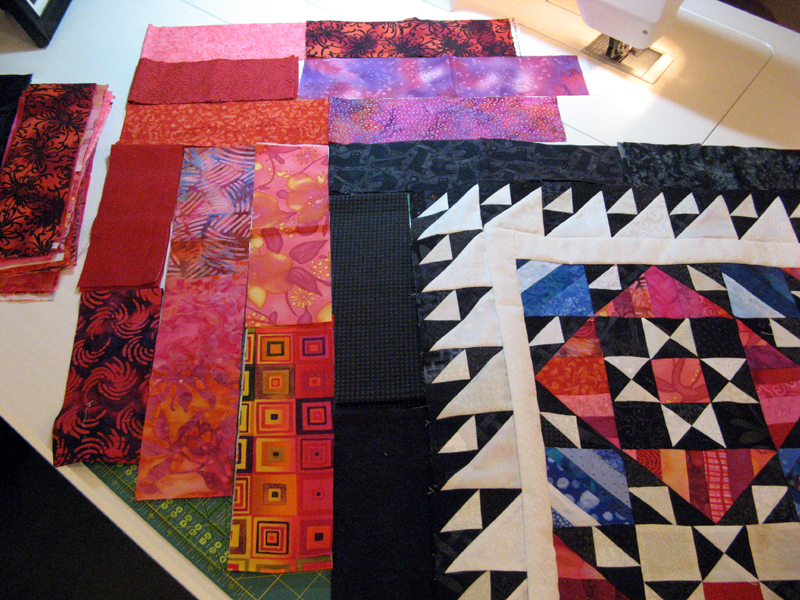 Today I'll spend much of the day sewing together the blocks of Part 7. I'm looking forward to getting Kordova Klosure's top together. I finished my March Sunshine Quilt Guilds BOM. We were to put anything BUT bugs into bug jars. I thought the spoons and forks were cute. 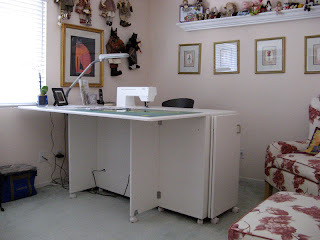 My sewing cabinet arrived yesterday around lunchtime. The delivery guys, three of them, were real nice. They had a major task at hand...to move 400 pounds to my sewing room which just happens to be on the second floor of my home. There's one landing on the stairs where it turns out they had to physically muscle the 400 pounds. A dolly was used to get it to the ramp where it came off the truck. Next a thorough inspection...looks good... Back on the dolly...watch those wheels! Up a step on to the front stoop and then another step over the threshold of the front door...looking good... Through the entryway and living room to the STEPS! EEK! Still on the dolly up nine steps to the landing. The biggest guy pulling the dolly and the two other guys pushing from the front. Landing YEAH take a deep breath...oh no Plan A won't work to turn it on the landing for the next seven steps...hmmm what to do now? Of course Plan B! Remove the dolly shift the cabinet on its right side around...watch those wheels! YEAH Plan B worked! Hmmm can't get the dolly back on not enough room on this landing. Plan C? Muscle it up one step at a time to the second floor...deep breath...you ready big guy? When they got to the top there was enough room for the dolly and back on it went. Down the hall to the second room on the right. Darn there's a difficult wall....hmmm off the dolly and slide it still on the right side into the room. YEAH take a deep breath! Next righting it on it's wheels, again a muscle job and a perfect one indeed. Next all the pieces for shipping were removed. Finally all the remaining parts were brought in and up to the sewing room for a bit of assembly. Hmmm where's the hardware packet that contains all the nuts and bolts, shelf clips, and special screwdriver for the lock nuts??? Don't see it here, not here either. Did you check all the drawers? Go look in the packing still left in the hallway...nope. Go look in the packing in the truck...nope. A call out to Koala. "Hello Koala, I just had a QuiltPro Plus IV delivered and we can't find the hardware pack." "Sandi did you look in all the packing? 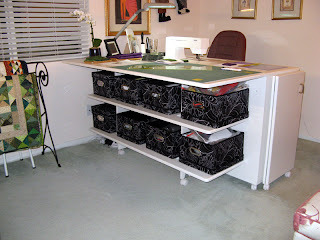 the drawers?" "Yes Koala. It didn't come in the shipment." "Sandi did you get the remote that operates the lift? It should be in that package." "Yes Koala. I did get the remote, but no hardware pack." "Sandi so sorry we will send it out FedEx Ground...it should get there soon." "Koala, that isn't fast enough how about FedEx next day...I've already had several delays." "Okay Sandi we'll send it the fastest we can. So sorry." 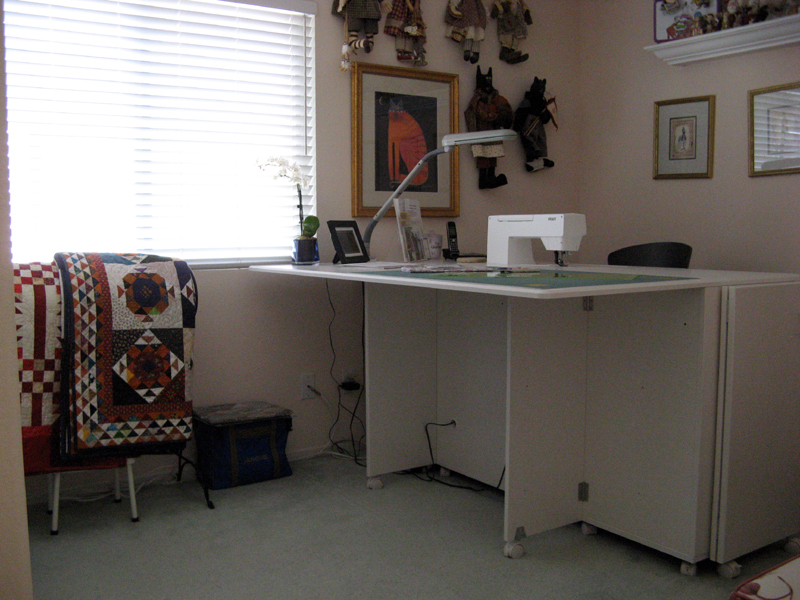 None of the shelves have been installed yet, but the lift works just fine and the sewing machine is in place and ready for action. The work surface is fabulous and no major problems discovered at this point. I love the clean white finish and my wing back chair still fits okay in the room. I'll be using a loaner stool until the Koala one arrives. Hopefully that will be within a couple of weeks. I've got all kinds of tools and supplies to move out of temporary totes and boxes into new homes either in the drawers or on the shelves once they can be installed. I'm thinking linen boxes from the Container Store will be perfect on the shelves. More to see another time when I've got the shelves in place and supplies in their new home. Here will be my view as I sew.